Mt. Gassan is one of the great mountain located in Yamagata Prefecture. It is chosen as one of 100 best Japanese mountains, 100 best flower mountains and 100 best water forests. It is also the main mountain of Dewa 3 sacred mountains of Shugendo. Therefore, on the top of the mountain, there is Gassan Shrine that enshrines Tsukuyomi no mikoto, the god of the moon. It is 1,984m tall active volcano that has a great view of all Yamagata prefecture from the top of the mountain. Most of the time, the mountain is covered with deep snow. So, it is also known as summer ski. 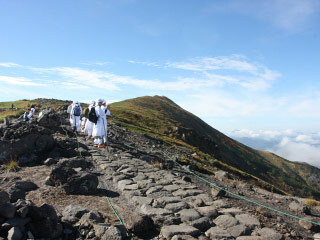 There are many trekking courses for this mountain. Entitled: 100 best mountains, new 100 best mountains, 100 best flower moutons, and new 100 best flower moutons. It is an active volcano which located in the middle of Yamagata prefecture. There fore it has a great view of all Yamagata. Gassan has snow all though the year. There is a shrine on the top of the mountain. To visit the top of the mountain, you have to join the official worship at the shrine. Gassan Shrine is one of the top class shrine in Tohoku Region. It was established in the time of the Emperor Suiko. It was used to be combined with Buddhism and popular for Shugendo. There is a ski resort that open during spring to summer. On the top of the mountain, there is a hotel for people to stay for great sunrise. There are many Onsen around this mountain, too.